Make this Sunny Side Up Hash Brown Breakfast Pizza for breakfast, brunch or even dinner. Whichever you choose, it’s always a winner! I haven’t shared a breakfast pizza recipe in quite a few years, so I thought it was time to come up with something new. The last one I shared, I called Easy Breakfast Pizza, and it dates back to 2011. This new recipe I call Sunny Side Up Hash Brown Breakfast Pizza uses pop-tube crescent rolls, frozen shredded hash browns, American cheese slices, eggs, diced ham, and chopped scallions for garnish. 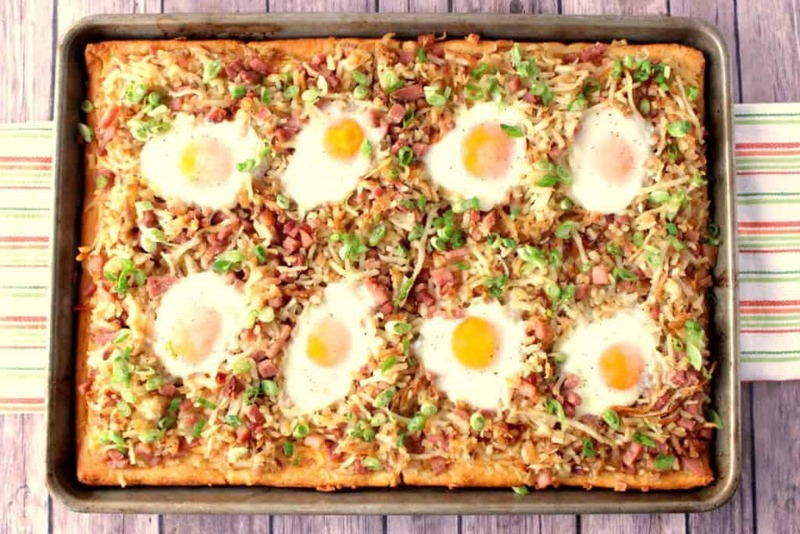 This Hash Brown Breakfast Pizza can feed several hungry people. However, the night I made it (we had it for dinner) I wasn’t feeding several hungry people. It was only my husband and myself. My point in telling you that was that the Hash Brown Breakfast Pizza heated up relatively well the very next day when my husband took to work for lunch. Since I had some leftover ham in the fridge, that’s what I used. But if you’d like to add some pre-cooked bacon or sausage to your breakfast pizza instead of ham, by all means, go for it. Or, if you’d like to leave the meat off entirely, do it! It’s your Hash Brown Breakfast Pizza, make it your way! Let’s get cooking. 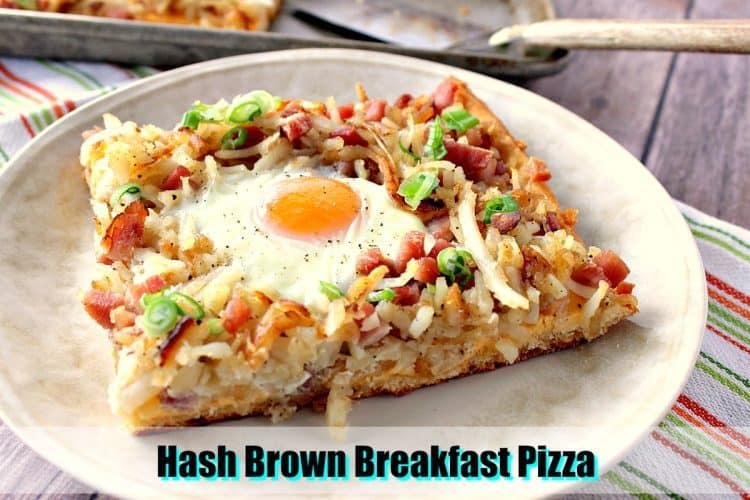 Hash Brown Breakfast Pizza will take approximately 30-40 minutes from start to finish. Roll out two tubes of pop crescent dough onto a 13″ x 9″ baking sheet. Partially bake the dough in a preheated 350-degree oven for 10-12 minutes. Remove the crust from the oven and top evenly with slices of American cheese (or your favorite variety of cheese). While the crust is parbaking, heat a large skillet over medium/high heat and add 2 tablespoons olive oil, and 2 tablespoons butter. Add one package (30 ounces) of frozen shredded hash browns that have been partially thawed. Allow the potatoes to cook in the skillet for 5 minutes before stirring. While the potatoes are cooking, dice up two cups of ham. Stir the potatoes and add 1 teaspoon coarse salt, ½ teaspoon black pepper, and the ham. Stir and continue cooking an additional 2-3 minutes. Spread the cooked potatoes and ham evenly over the prepared crescent crust with cheese. Make 8 wells in the hash brown topping and carefully crack 8 eggs into each of the wells. 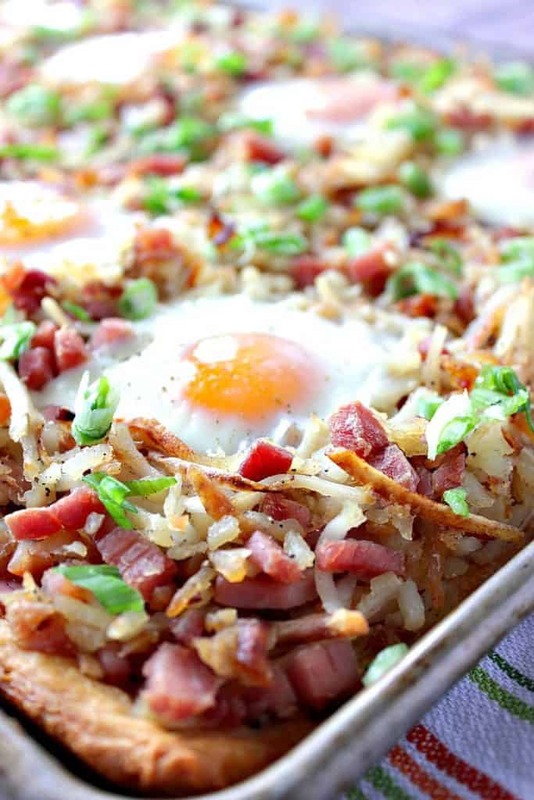 Bake the Hash Brown Breakfast pizza for an additional 20-25 until the eggs are your desired doneness. Top the pizza with chopped scallions if desired and serve immediately. 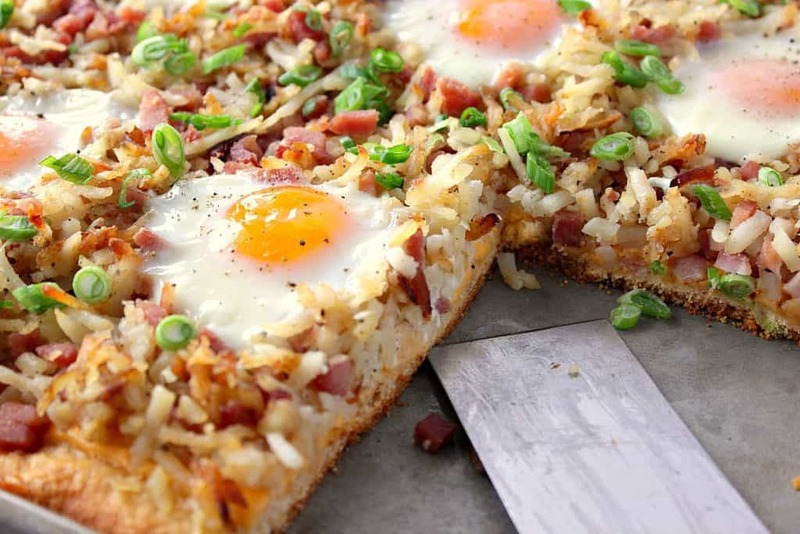 Make this Sunny Side Up Hash Brown Breakfast Pizza for breakfast, brunch or even dinner. Whichever you choose, it's always a winner! Roll out and press the crescent dough evenly into a 13" x 9" baking sheet, closing all the perforations. Bake the dough in a preheated oven for 10-12 minutes. Remove the dough from the oven and place the cheese slices evenly spaced over the top of the dough. Set aside. While the dough is pre-baking heat the butter and oil a large skillet over medium/high heat. Add the potatoes in an even layer in the skillet and allow to cook for 5 minutes without stirring. Stir the potatoes and add 1 teaspoon salt, ½ teaspoon pepper, and the ham. Stir well. Cook the potatoes and ham for an additional 5 minutes and remove from heat. Carefully spoon the potatoes and ham mixture evenly over the partially baked crescent roll and cheese slices. Use a spoon to make 8 wells in the hash brown potato mixture and carefully drop 8 eggs into the wells. Season the eggs with salt and pepper. Place the hash brown breakfast pizza back into the oven to cook for an additional 20-25 minutes, or until the eggs are cooked to your desired preference. Remove the pizza from the oven and top with the chopped scallions, if desired. Cut the pizza into squares and serve hot. I sincerely hope you’ve enjoyed this recipe for Sunny Side Up Hash Brown Breakfast Pizza as much as I’ve enjoyed bringing it to you! Should have any questions regarding this recipe, or anything else you see on my site, please don’t hesitate to contact me directly, or leave me a comment in the comment section below. It is always my distinct pleasure to get back to you with a reply just as soon as I possibly can! Love the sound of breakfast pizza! I love the idea of having pizza in the morning! This is such an amazing recipe! Yum! Thank you. Glad you think so too! Glad to hear it, Helene! Thank you!! What a delicious looking breakfast for a crowd and so easy! This will come in handy for the holidays when the house is always full. Aren’t you sweet!! Thank YOU so much for being a reader! Merry Christmas to you and Happy New Year, too! !